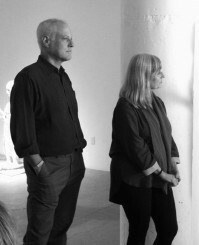 Since the early 1980s, Nora Ligorano and Marshall Reese have collaborated together as the artistic duo LigoranoReese. Their work is an ongoing investigation into the impact of technology on society and the rhetoric of politics and visual culture in the media. LigoranoReese's body of work is multidisciplinary and includes limited edition multiples, videos, sculptures and installations which involve a range of unusual materials and industrial processes. LigoranoReese’s most recent solo exhibitions include 50 Different Minds at the Portland Art Museum in Portland, Oregon and If You Lived Here at the Massachusetts College of Arts in Boston, Massachusetts in 2012. In 2014, their work IAMI, a multi-media, interactive, fiberoptic tapestry was the subject of a media room installation at Catharine Clark Gallery. In 2016, their most recent public artwork, the melting ice sculpture The American Dream, was featured in two venues in Philadelphia and Cleveland to coincide with the Democratic and Republican National Conventions, respectively. The American Dream received extensive coverage from publications such as the New Yorker, the New York Times and The Creator’s Project, amongst others. LigoranoReese’s work is included in the permanent collections of numerous institutions, including the San Francisco Museum of Modern Art, the New York Public Library, the Whitney Museum of American Art, and the Getty Institute. LigoranoReese live and work in Brooklyn, New York and have been affiliated with Catharine Clark Gallery since 2010.